Credit: 3DConnexionAre you a serious 3D artist? If so, you don't need me to tell you that most mice are designed with 2D programs like Paint and Photoshop in mind. At most, you might get a (lame?) gaming mouse of this type. What you need is a good 3D mouse that you can use to make those repetitive tasks go by faster. If you're like me, you're not getting paid by the hour. You get paid for productivity. That means you look for ways to shave seconds off those repetitive tasks while still getting the same quality level your clients expect. In that case, you will probably consider a device like this to be an investment. Once you get the hang of your new 3D mouse, you'll notice that your productivity and your paycheck goes up. Over time, you'll make back the money you spent on the mouse and much more because you didn't skimp now. Once the day is over, you'll probably want to take care of your own projects for a while. You might dream of creating the next Big Buck Bunny or Angry Birds, right? A mouse like this will speed up your productivity and impress your friends, maybe even your significant other who doesn't understand why you disappear for hours into Geekland until you use your awesome 3D printer to make him/her the best Valentine gift ever. That will be so totally worth it to any true geek. Seriously, these things are cool. A truly good 3D mouse will give you all the functionality of the best 2D versions with that extra dimension needed to work with your models. Of course, you don't want to buy just any old thing. You have to consider exactly how serious you are about your work. You have to think about whether it's just another expensive accessory or an investment that can save you time and impress those less-serious artists who are stuck using a 2D mouse. Does it work with your preferred OS and 3D program? That should be your number-one consideration. If it doesn't have an up-front list of programs and operating systems that it is compatible with, you might be better off choosing one that does. If the reviews say it doesn't work that great for Mac, that might well be a heads-up if you're working on an iMac for a boss who owns stock in Apple Corporation. Seriously? Look for one that is compatible with Linux. Any serious geek is not going to be stuck with just a choice between Windows and Mac. What kind of features does it have? In this realm, a good 3D mouse is like a good gaming mouse. The best ones come with more than a dozen customizable buttons, rotate along all three axes, and just look exactly like what they are: a specialized mouse that looks like the manufacturers offered their resident geek a trip to the best hackathon ever if he could design the perfect mouse. At the minimum, it should have useful controls for rotating around all three axes and customizable controls for all the common tasks you perform using a mouse and your 3D program. Don't let a learning curve scare you. Seriously, folks, if you were afraid of learning how to use a complex gadget, you probably wouldn't be working with a 3D program in the first place. Am I right? The truly complex ones are going to take some getting used to, but will save you a lot of time in the long run. Does it get good reviews from people just like you? Because you're a savvy purchaser of computer accessories, you're probably all over this. Which would you rather trust, reviews from people just like you or the advertising hype from a manufacturer? 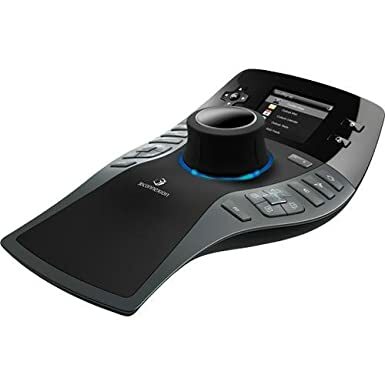 Sure, this one from 3DConnexion is expensive and it has a lot of buttons, but don't let that stop you if you're serious about getting a good 3D mouse. The buttons can be customized so you get the full use out of your computer, not just your 3D printer. Need to create a macro in your spreadsheet software? Set a button for it. Need to send a document in a quick email? Set another button. Those seconds add up and can pay off huge if you're being paid for productivity rather than by the hour.